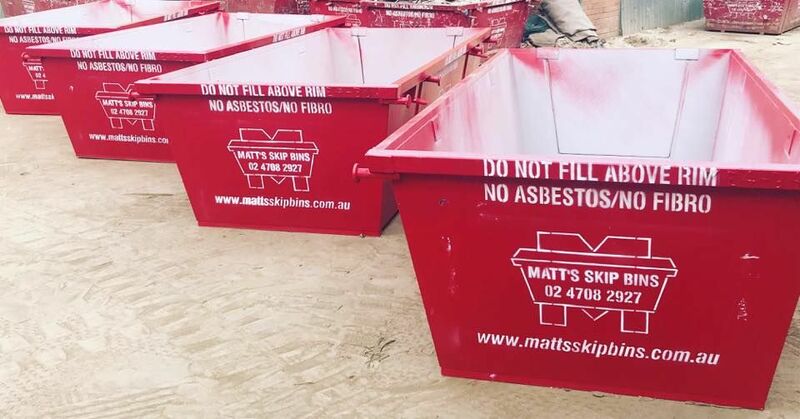 The table below provides some guidelines but if you are in any doubt at all, please feel free to contact Matt’s Skip Bins and one of our friendly representatives will be able to assist you. Any metal, appliances, dry car parts/batteries/radiators to be loaded TOWARD THE TOP of the bin for recycling – NOT ON TOP above the rim. Brick and Concrete ONLY. Roof and floor tiles, pebbles, rocks, slate or pavers, blocks are OK if discussed when quoted. Dirt or any other waste at all. Disposal facilities are very strict with enforcing that only concrete material are allowed in these bins. NO GRASS OR CONTAMINANTS – Disposal facilities are very strict with enforcing that only dirt and clay are allowed in these bins. Organic waste such as grass and tree clippings, branches, woodchips, bark and light timber. Tree trunks/stumps over 150mm in diameter, palm trunks/stumps, timber sleepers, soil/dirt/ rock. Shovelling bark out of a garden along with dirt is not considered “green waste” and may attract extra charges. NEVER TO BE PLACED IN SKIP BIN OF ANY KIND!